Ofsted is the regulator for some social care providers, mainly those that provide fostering, adoption or residential placements for children. This means that we register and inspect providers and can take enforcement action if we’re concerned about practice. Because of this, there are regulations that state that certain types of social care provider must tell us about the most serious incidents that happen to children placed with them and what they have done in response. By law, six types of providers must make notifications. These are: children’s homes; independent fostering agencies; voluntary adoption agencies; adoption support agencies; residential family centres; and residential holiday schemes for disabled children. We also receive serious incident notifications from local authorities, although these are a different kind of notification to the ones discussed here. Other providers should not make notifications to us. In practice, providers sometimes also notify us about incidents that do not meet these criteria, or that are not as serious. This is often because there’s a perception that we’d want or need to know anyway or that we’d criticise the provider for not telling us. Actually, this is not the case. We only want to know about events covered in the regulations. For everything else, the provider should not notify us about it. We sometimes receive multiple notifications about the same incident. This might be because more information becomes available, so the provider sends an update, which can be useful. However, we encourage providers to send updates by email, not as new notifications, to reduce duplication both for them and for us. We also sometimes get multiple notifications because providers submit a notification online and also send a paper copy of the form. We’d like to discourage providers from submitting twice – we only need the online form. Providers should only use the paper one if they cannot access the online system for some reason. Again, this helps to reduce duplication for us both. How many notifications are made, and by whom? For this blog, we looked at notifications in 2017–18, but the numbers are similar in other years as well. There are around 2,700 providers in the groups required to make notifications to us. 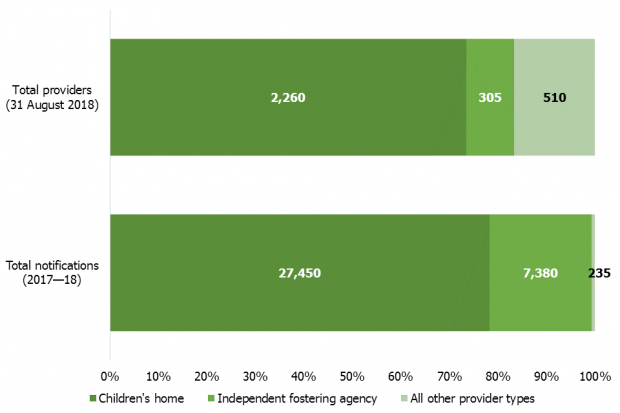 Most of these 2,700 providers are children’s homes (2,180) and independent fostering agencies (305). As you can see above, the vast majority of notifications in 2017–18 came from children’s homes and independent fostering agencies. This was true in other years as well. 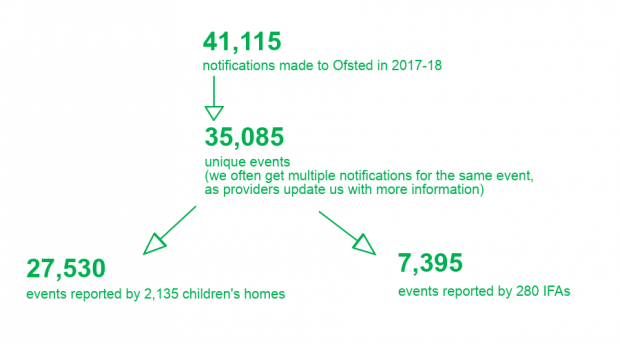 Because most notifications come from children’s homes, we wanted to look at those in more detail. We found that privately owned homes account for most of the events covered by notifications: 78% came from these homes. That makes sense: most children’s homes (73%) are privately owned, so we’d expect them to have the most notifiable events. 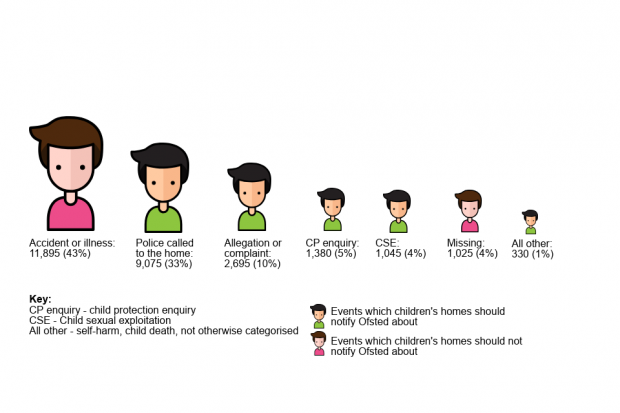 We also saw the opposite pattern: local authorities accounted for only 16% of events covered by notifications, and owned 19% of children’s homes. The rest of the events covered by notifications came from voluntary owned children’s homes. What do children’s homes notify Ofsted about? We divided the notifications into two main groups: events that providers must notify us about according to the regulations; and events that providers should not notify us about, mainly accident or illness and missing children. For children’s homes, three quarters of events were accident or illness (which they should not notify us about), or the police being called out to the home (which they should). This can seem worrying: are lots of children living in children’s homes being injured, becoming victims of crime, or even perpetrators of crime? Actually, no. We’d expect notifiable events in children’s homes to break down this way. Some children living in children’s homes will be disabled children, who may be more likely to need a hospital visit as part of managing their disability. This is one reason for why we ask children’s homes not to notify us about accidents or illnesses. Similarly, when the police are called to the home, it’s often because a child has gone missing, not because they’ve been involved in crime. Again, we do not need to routinely know about children going missing, even if the police are called out to help look for them. The exception is if the child is at grave risk due to age or vulnerability, or if they have been missing for a considerable period of time and the home does not know where they are. We’re currently doing some more analysis on notifications, particularly police callouts to the home, because we know they can tell us a lot about what’s happening to children and what’s happening in children’s homes. We’re interested to know more about providers’ experiences of submitting notifications, particularly any issues they find with the current system, and why they notify us about things that do not meet the notification criteria. If you’re a children’s social care provider, please consider taking a minute to fill in our short survey about notifications. You can read the guidance for providers on submitting notifications. This also contains links to all the relevant legislation around notifiable incidents for different provider types. We’ll also be publishing our ‘Children’s social care in England’ report in the summer, on our children’s social care statistics webpage. Implementing the social care inspection framework: how did we do? What are the common features of the best residential special schools? What about Care leavers who live in unregulated 'supported ' living providers ?????? DfE/ Ofsted/ CQC/ Directors of Children and Adult SC /Care leavers and good enough parents (who parent at a distance) of those young people and adults need to have a good long think about that. If those young people and adults survive corporate parenting and are not involved in the Criminal justice system before the age of 16, it won't take long for them to be let down post 16 when not being held in mind. The question always needs to be asked WOULD THIS BE GOOD ENOUGH FOR YOUR CHILDREN (yes I am shouting ).